It's several shades on one compact. You can apply them individually or use the Kabuki Brush to sweep across all colors at once and get a unique bronzing experience. The colors are true and go on nicely. Highly recommend. I was first introduced to Snow Bunny by a friend because I loved the way her skin looked. So pretty. It's expensive, this is true. But it's not cray cray expensive like Chanel or something. I like the four colors, although they ALL pull gold, which is fine, just an observation. Lightly dusted on my cheeks is just enough to make my face come alive. If I'm in a serious rush I'll simply use this and ...read moreit takes away the redness in my cheeks enough to give it a blended look. I favor that so for me it's a winner. It's fair to note that is shimmery, but in moderation it looks fabulous. And I think Too Faced is a fun and clever brand. Great addition. I love this for the winter. My previous bronzer was the blended face powder from clinique in transparency bronze, I used it for over 10 years and I still think it is a nice bronzer, however I am learning to embrace my natural skin color and I find that this bronzer adds the perfect amount of color to pale skin without making it look dirty or overly dark. I think the shimmer looks subtle and I like to use the pink and white side as a highlighter over my tarte amazonian clay blush to add a hint of shimmer. I LOOOOVVVEEEE Too Faced bronzing/highlighting powders. I have snow bunny, sun bunny, and pink leopard and I love all of this. I'm on my third snow bunny already and will be repurchasing when I run out. I'm a very fair Asian and snow bunny gives my skin an amazing golden glow and I've gotten compliments on how pretty my skin looks when I've worn this out at nights. 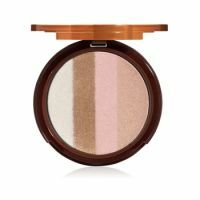 I'll usually wear snow bunny with no blush when I do a smokey eye since it gives my skin a very subtle, shimmery golden glow. I'll wear sun bunny during the days when I'm at work b/c it's more work appropriate and gives more healthy color. Snow leopard is when I wear normal eye makeup (not dark) and so can afford a bit more color on my cheeks. All of these are terrific and hopefully they'll never be discontinued. this is an awesome highlighter! it isn't ultra shimmery, but really reflects light. the bronzer is of great quality by itself and if u dont mix it with all the other colors, its pretty useful. but since the ratio of the highlighters is greater than the bronzer, you wont get very bronzed with this powder. i love it and i use it quite often! it gives a natural look and highlight.